The ANITA payload getting ready in Antarctica. Almost everything that we know about the Universe comes from studying photons. Over the last century we have progressed from studying only photons from the visible spectrum which we can see with our eyes to exploring the full electromagnetic spectrum; using radio, infra-red, ultra-violet, x-ray and even gamma rays. However, at the highest energies and largest distances the Universe becomes opaque to photons. So a new form of astronomy is necessary. One intriguing possible cosmic messenger is the neutrino. Neutrinos, whose name means 'little neutral one', are the lightest of the matter particles and only interact via the weakest of the forces of particle physics. Because they are so reluctant to interact neutrinos can travel across vast cosmological distances and arrive at the Earth carrying information from the distance universe. The big challenge is, of course, how to detect them when they do arrive? Ultra-high energy (UHE) neutrino astronomy is aiming for higher energy (>1015eV) neutrinos which have travelled cosmologically interesting distances. A single UHE neutrino with an energy of 3x1020 eV has the same energy as the tennis ball from a Murray 1st serve, but they occur much less frequently. Cosmic rays of this energy are predicted to impact the earth at a rate of 1 per century per km2. This low rate and the fact that neutrinos interact only weakly with matter makes the detection of UHE neutrinos very challenging. One either needs to instrument a large region with many detectors or have a few detectors that can detect over a very large region. At UCL we are involved two collaborations that exploit the Askaryan effect to detect neutrinos via their interaction in ice. 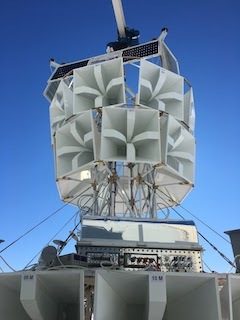 The ANITA experiment is seeking to detect UHE neutrinos via the radio Askaryan signal using antennas on a balloon that will fly over the Antarctic ice. The ARA experiment is placing radio antennas directly into the ice at the South Pole.